Before Alexis Tsipras, Europe battered François Mitterrand's reformist ambitions into a sweeping neoliberal program. In the story of Greece’s subjugation by European capital, there is a seemingly endless cast of villains. At the top of that list are Angela Merkel and the almost cartoonishly loathsome Wolfgang Schauble. Right below them, officials like Jeroen Dijsselbloem, president of the Eurogroup of finance ministers, a caricature of a grey-suited technocrat. But in the end, these words amounted to nothing. Hollande, the “good cop,” stood side-by-side with Merkel and other eurozone leaders, as they pushed Tsipras into accepting a “compromise” deal that imposed devastating terms on the already-ravaged Greek economy. For the far left, this sordid affair provided confirmation, in case there were any doubts, that all the rumblings of growing French-German tensions over the euro during the past year meant little. And really, how could anyone expect anything else? Why would the French government, which has made austerity the pillar of its own economic agenda at home, lead the charge against austerity abroad? The actions of Hollande’s Socialist Party (PS) government constitute one more reminder of just how rotten the carcass of European social democracy has become. In this regard, the PS’s role in the evisceration of Greek democracy was hardly unique on the European center-left: quite the contrary, Europe’s social-democratic and labor parties were, for the most part, firmly behind Merkel and Schauble throughout the negotiations with Greece — literally so in the case of Sigmar Gabriel, leader of Germany’s Social Democratic Party (SPD), who serves as vice chancellor in the grand coalition Merkel heads. Still, the role of the French Socialist Party stands out for a different reason — not because of what the PS is but for what it was. Thirty-five years ago, a previous PS-led government faced a situation strikingly similar to that which confronted Syriza after its election this January. That the party of Hollande and Valls could once have represented anything resembling Greece’s party of the radical left might seem bizarre to us today. But in 1981, when PS leader François Mitterrand swept into office as the first president from the Left in the history of the Fifth Republic, the hopes he inspired were similar to those generated by Syriza after its election in late January. If anything, the expectations that surrounded Mitterrand were much greater than that which greeted Tsipras earlier this year. 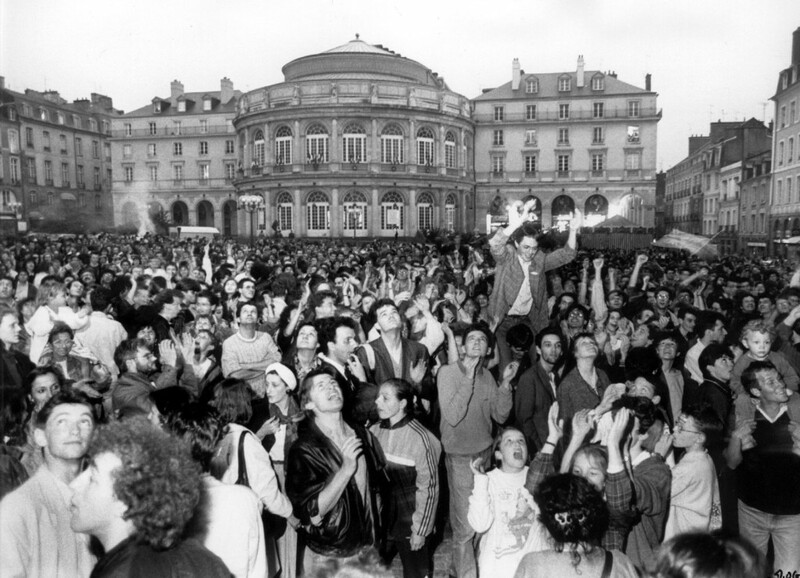 On the night of May 10, 1981, when the final results of the balloting were announced, celebrations broke out on the streets of French cities. In Paris, tens of thousands gathered at Place de la Bastille, where they sang and danced until the early hours of the morning. Five weeks later, the Left backed up Mitterrand’s success by winning a majority of seats in the National Assembly in legislative elections. That set the stage for the formation of a government that (for the first time since 1947) also included Communist ministers. Mitterrand’s origins lay not on the far left, but in the more moderate corners of French republican socialism. An inveterate opportunist, his commitment to principle went only so far as his political ambitions would allow. And yet the future president had moved progressively leftward over the course of his life — from his youthful exploits as a supporter of the collaborationist Vichy regime, through his conversion to the Resistance left, to his days as a moderate socialist minister in the short-lived cabinets of the 1950s, to his failed 1965 and 1974 presidential runs, and finally his entrance into the PS in 1971. His career arc mirrored the gradual evolution of French socialism during the decades after World War II: in the 1950s, the socialist left was represented by a fragmented collection of small, mostly marginal parliamentary parties, seemingly destined to serve as junior partners in an endless series of coalition governments. Only twice (for brief spells) had a representative of the Left held executive office during all the decades between the Popular Front and Mitterrand’s election — and of those governments, by far the longest-serving was that of Guy Mollet, whose stint as premier was notable mainly for his role in prosecuting the slaughter in Algeria and launching the 1956 invasion of Egypt with Britain and Israel. Following Charles de Gaulle’s return to power and the establishment of the Fifth Republic in 1958, the Left was excluded from national office for more than two decades. Under the French Fourth Republic, Mitterrand had served in a series of short-lived coalition governments — including brief spells in the only two left-led governments of the entire postwar era: in 1954, he joined the cabinet of Pierre Mendès France as minister of interior, remaining in that position until the administration collapsed a year later. Soon afterwards, he again entered government, this time as Guy Mollet’s justice minister. 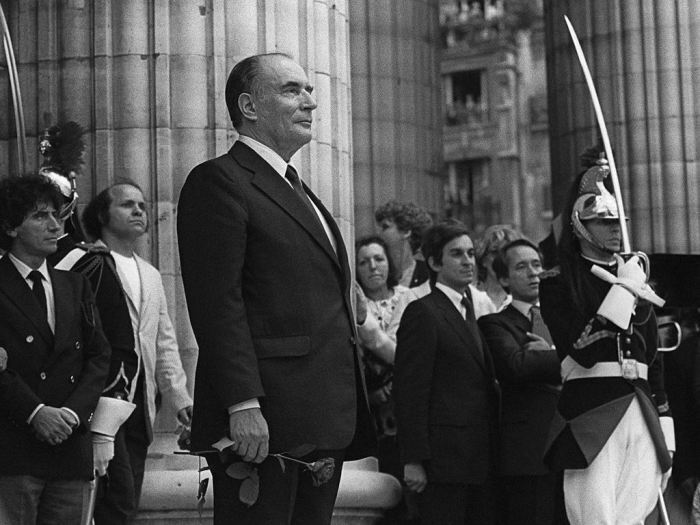 Mitterrand’s activities as a cabinet minister during these years were most notable for his involvement in the repression of the movement for Algerian independence. Early in the decade, Mitterrand had made his feelings on Algerian independence clear, when he had proclaimed, “Algeria, that’s France.” As Justice Minister under Mollet, he ordered the extension of martial law and recommended the death sentence forty-five times. Mitterrand later regretted his role in France’s war, which eventually cost the lives of upwards of a million Algerians. But his involvement was indicative of the brutal colonial nationalism that marked the French socialist movement as a whole during these years. During the 1960s, the stigma attached to the Left due to its complicity in the war would seriously hurt the reputations of Socialist leaders like Mollet. Mitterrand however, largely avoided the stain of the slaughter in Algeria. By the 1970s, French socialism was transforming. In 1969, the fractured organizational representatives of the non-Communist left had come together to form a unified Socialist Party. And at the party’s Épinay Congress, held in June 1971, Mitterrand joined, along with his supporters, immediately managing to get himself elected as the party’s leader. Reform or Revolution? I want to say . . . yes, revolution. And I would immediately point out . . . the daily struggle for structural reforms can be revolutionary in nature. But what I have just said could be an alibi if I did not add a second sentence: violent or peaceful, revolution is first a break. He who does not accept the break — and the method that follows from it — one who is not willing to break with the established order . . . with capitalist society, that person, I say, cannot be a member of the Socialist Party. The radicalism of Mitterrand’s 1980 electoral program embodied the fruits of this trajectory. But it also reflected the influence of a changing political context, in France and in Europe, during the 1970s. Thus, on the one hand it reflected the Socialists’ desire to compete with the Communist Party (PCF), traditionally the hegemonic force on the French far left, for votes and influence, as well as the impact of France’s growing economic difficulties in national political debates. More broadly, it was emblematic of a leftward turn in social democracy after the 1960s, amid a burgeoning economic crisis and escalating class struggle. That shift was apparent in social-democratic parties across Europe, as more left-wing forces gained traction in country after country — a dynamic manifested, during these years, in everything from the rise of Bennism in the British Labor Party, to the plans adopted by the Swedish Social Democrats for wage-earner funds to gradually socialize private industry. Indeed, in many ways, Mitterrand’s victory represented the high-water mark of social-democratic radicalism during the postwar period. But if the Mitterrand experience reflects the radicalization inside European social democracy during the 1970s, it also points to the limits of that radicalization. And in that regard, the early years of his presidency were characterized by his attempt to grapple with the same kinds of constraints that the Syriza government faces today in Greece. To understand this point, it’s important to understand the context for the Left’s triumph in 1981. Mitterrand came to power that year in the midst of a long-term crisis of European capitalism. That crisis had hit France especially hard. Confronted with rising unemployment, growing inflationary pressures, and stagnant business activity, the new president promised to take drastic measures to revive the French economy. To that end, Mitterrand proposed extensive nationalizations of France’s increasingly uncompetitive industrial conglomerates, in order to maintain employment levels and aid the process of economic reconstruction. This was not intended to be an expropriation of French capital, but a compensated purchase of unprofitable firms that otherwise might go bankrupt. In the context of French politics in the late 1970s, the government’s nationalization plan was not as radical as it might appear in retrospect. Indeed, French capitalism had a long tradition of government planning and state-led economic growth. After World War II, a variety of industries had been seized by the state. In 1946, the government had set up a planning commission which produced long-term plans to guide economic development: over the next forty years, nine five-year plans were issued by the state. Even outside the state sector, firms depended heavily on the government for access to credit; between 1969 and 1981, the French state was responsible for as much as half of all private sector investment. After Mitterrand’s 1981 victory, thousands descended on the Place de la Bastille. Fundamentally, Mitterrand’s nationalization plan represented an attempt to revive and extend the postwar dirigiste model. The aim was not to attack private property, but to facilitate economic restructuring and save France’s struggling industrial base. Officials in the government expected a rapid improvement in the global economic situation, which they believed would help restore the unprofitable firms to health. They also intended to subsidize economic activity through deficit spending. In the end, this was a Keynesian economic program, not a socialist challenge to the prerogatives of capital. Yet in implementing that program, Mitterrand ran up against the limits of what European capitalism would tolerate. As a result, his government soon faced a dilemma — whether to proceed with its initial economic agenda, in the face of growing difficulties and entrenched hostility from business interests, or abandon its program of Keynesian reflation. The difficulties facing Socialist Party officials were exacerbated by France’s membership in the European Monetary System (EMS), the precursor to the eurozone. By tying the French franc to the German Deutschmark, the EMS restricted the government’s ability to adjust monetary policy to meet the country’s macroeconomic needs. In the end Mitterrand chose the path of capitulation, leading to his government’s famous 1982-83 turn toward rigueur, or austerity. The repercussions of that decision are still being felt today. His reversal and subsequent move to the Right precipitated the long-term process of privatization and neoliberal restructuring in French capitalism; simultaneously, it resulted in the transformation of the Socialist Party into an agent of the market. More ominously, Mitterrand’s U-turn laid the groundwork for the far-right’s growth; it was in 1983 that the National Front (FN) of Jean-Marie Le Pen achieved its first electoral success, in local elections in the suburban town of Dreux. Just one year later, the FN made its big breakthrough in the 1984 European elections. By the end of the decade, the FN — a party that had been so marginal just a few years earlier that Le Pen couldn’t even get enough signatures to run for president — was garnering double-digit vote totals. Today, Jean-Marie’s daughter and successor Marine Le Pen has rocketed to the top of the polls for the 2017 presidential election, as voters disillusioned by Hollande’s economic failures and unpopular labor market reforms have increasingly turned to the FN. To understand the factors that precipitated Mitterrand’s capitulation, we have to begin by looking at the conditions facing French capitalism in the crisis of the 1970s. This decade marked the end of the long period of postwar growth and full employment that was known in France as the trente glorieuses (“thirty glorious years”). As a result, the years after 1974 witnessed a general slowdown in business activity, as investment and profit rates fell and productivity growth stagnated. While workers were still able to secure significant real wage gains during the early and mid-1970s, unemployment (which had been almost nonexistent at the start of the decade) rose steadily after 1974. The deteriorating performance of the French economy reflected a more general trend in European capitalism; as the favorable conditions of the postwar “Golden Age” evaporated, policymakers across the continent were forced to confront problems of escalating joblessness, rising inflation, and slowed productivity growth. In France, governments responded through vacillating economic policies: first seeking to revive the economy through deficit spending, then moving toward fiscal retrenchment and monetary restraint, then reversing course again. These conditions proved to be a boon for the French left. Long dominated by France’s powerful Communist Party, the Left had remained sharply divided into the middle of the 1960s, split between the large but isolated PCF and the much smaller forces of French socialism. In the late 1970s, the Communists still claimed over half a million members. They constituted a powerful electoral force at the national level: consistently winning between a fifth and a quarter of the vote in legislative elections as late as 1969 (although that figure had been slightly reduced since the 1950s), the party’s presidential candidate Jacques Duclos had been able to garner more than 21 percent (almost 5 million votes) in the first round of the presidential election. But the PCF’s real electoral strength lay at the local level, where it controlled a vast array of working-class municipalities, including a number of big cities. At the height of its local power, in 1977, the PCF ran local government in 72 of the 221 municipalities in France that had over 30,000 people. Moreover, the Communists exerted enormous influence within the labor movement through their links with the General Confederation of Labour (CGT), France’s largest trade union confederation. The CGT was an explicitly Communist-led union, which closely hewed to the PCF’s line on most domestic and international questions (making it the target of widespread criticism in the context of the Cold War). At the end of the 1970s, it had over two million members — an impressive number given the absence of the closed shop in France’s industrial relations system — and was particularly well represented in manufacturing and heavy industries. While the Communists had traditionally represented the most militant wing of the French labor movement, in the aftermath of May 1968 that was no longer necessarily the case. Many younger French workers who were radicalized in the heady days of May had come to view the CGT as conservative and bureaucratic — undemocratic Stalinists with no vision of how to remake a hierarchical society and no interest in workplace democracy. During the late 1960s and 1970s, many of those workers had made their way into the French Democratic Confederation of Labour (CFDT), France’s second biggest union confederation, which developed close links with sections of the PS. In the aftermath of 1968, the CFDT was gravitating to the left, adopting proposals for autogestion, industrial democracy, and even urban planning. The capitalist system is profoundly shaken but will not be irreparably condemned. No one can say how the crisis will come out. There will be no determinism or self-correction. Between authoritarianism and self-managed democratic socialism, as well as all the intermediate solutions, nothing has yet been decided. At the end of the 1960s, relations between the PCF and PS, and between the CGT and CFDT, were characterized by deep-seated suspicion on both sides. Mitterrand himself is said to have been hostile to the Communists ever since his days in the French resistance. But he also understood that the only way to revive the Left’s fortunes — and, concomitantly, his own — was through an electoral alliance with the PCF. To that end, he spearheaded negotiations with the Communists on what became the 1972 “Common Program,” a platform for a united left electoral alliance. Centering on a series of radical reforms including extensive nationalizations, welfare state expansion, and the strengthening of union rights, the Common Program reflected the growing reform ambitions of the French left during the 1970s. The Common Program captured the imagination of the whole left. It was not a revolutionary program, but a program of reforms. Nevertheless, its aim was not simply to tinker with the existing system, but to lay the groundwork for socialism. To that end, the Common Program was geared toward the conquest of the commanding heights of French capitalism. Our fundamental objective role is to rebuild a great Socialist Party on the ground occupied by the CP, itself — to demonstrate that of the 5,000,000 Communist voters 3,000,000 can vote Socialist. That is the reason for this agreement. The Communists, on the other hand, were never quite certain how to approach Mitterrand: on the one hand, the Socialist leader offered them the legitimacy provided by an electoral agreement, and the prospects of ministerial positions in a coalition government. On the other, he wasn’t shy about his desire to capture the PCF’s base. While Mitterrand was always clear about his goal of replacing the PCF as the leading force on the French left, the Communists were uncertain about how to respond to his overtures. Tensions between the two parties came to a head in 1977, following a sweeping victory for the Left in municipal elections. With the 1978 parliamentary elections on the horizon, and in the face of widespread hopes that the Left would emerge with a legislative majority, the PCF used disagreements over a variety of political issues as the occasion to break the alliance. That earned them opprobrium from many left-wing voters, and cemented the PS’s status as the party of left unity. Nonetheless, when Mitterrand ran for president in 1981, the Communists saw which way the wind was blowing. Once their candidate had been defeated in the first round of balloting, they threw their support to Mitterrand. And in the legislative elections held soon after, they got their first taste of what the Left’s rise to power would bring them: despite the absolute majority that the Left gained out of the election, it was the PS that took all of the additional seats — indeed, the PCF actually lost support to the Socialists in the election. It would never recover that ground. The victory of that Communist-Socialist alliance in 1981 produced euphoria on the Left. But when the new government took office, it faced a bleak economic situation. Unemployment was rising steadily, reaching 6.3 percent in 1980 and 7 percent the next year. Inflation, which had averaged an already troubling 9 percent during the 1970s, passed 12 percent in 1980. Investment and productivity growth were stagnant. France’s trade deficit had ballooned to unsustainable proportions, putting severe pressure on the value of the French franc. As he sought to implement his program of economic reflation in order to deal with the effects of the crisis, Mitterrand was hampered by a number of factors. For one thing, France was confronted with a particularly unfavorable global economic environment at the start of the 1980s. The recession that engulfed the advanced capitalist world in 1979 had hammered France’s already-weakened industrial sector, crippling traditionally important industries like steel. Moreover, the effects of the recession were exacerbated by the US Treasury’s high interest rate policies, as the Federal Reserve attempted to engineer a slowdown that could finally bring inflation under control (a policy known as the “Volcker Shock,” after the Reserve’s chair, Paul Volcker). The shakeout from the Volcker Shock had not only resulted in a severe decline in the US economy (along with the rising fiscal deficits that the Reagan administration continued to run), but also in ripple effects throughout Western Europe. With the value of the dollar at an all-time high, officials in other countries quickly moved to deflate their own economies, in order to prevent their currencies from losing value relative to the dollar. In Europe, the most important economy was that of the German Federal Republic. And the most important institution in German capitalism was the powerful Bundesbank, which had a reputation for pursuing tight-money policies designed to counteract inflationary pressures. Following the lead of its American counterparts, German policies engineered a sharp recession in 1980–81. The effects of these deflationary policies were felt all over Europe, and particularly in France. With the value of the dollar and the Deutschmark rising rapidly, the cost of importing goods denominated in those currencies rose as well. Since France was heavily reliant on imports for many basic necessities (including 80 percent of its energy consumption), and since 37 percent of total imports were denominated in dollars, the skyrocketing value of the dollar put major strains on the French economy. At the same time, in the context of the reflationary policies pursued by the Mitterrand government, deflation in the US and Germany exacerbated the downward pressures on the franc. It was for that reason that Mitterrand found himself pleading with Ronald Reagan to ease the pressure on the franc at an economic summit held in Versailles in June of 1982. By cutting fiscal expenditures, the Reagan administration could slow demand for the dollar and thus relieve the pressures on the franc. When Reagan said no, the French government was forced to undertake what would be its second devaluation of the franc. But while Mitterrand denounced the deflationary policies of the American and German governments, he could do little to change them. Also restricting French officials’ freedom of maneuver was France’s membership in the European Monetary System. The EMS was an exchange rate system negotiated by French President Giscard d’Estaing and German Chancellor Helmut Schmidt at the tail-end of the 1970s. It was designed to ensure that the value of the franc and the Deutschmark remained within fixed boundaries, by means of the Exchange Rate Mechanism (ERM). One of Giscard’s hopes in creating the EMS was that it would encourage French officials to adhere to the fiscally responsible, tight money policies he favored. By tying the franc to the Deutschmark, the EMS would limit policymakers’ ability to increase spending: since the value of the franc would have to remain at a high enough rate that the peg could be maintained, future governments would be forced to eschew policies that might erode the franc’s monetary position too greatly. Instead of expansionary measures to boost job and wage growth, policymakers would be more predisposed to prioritize price stability and cost competitiveness. In the end, Giscard’s gambit proved successful. Following his government’s turn toward rigueur in 1982–83, Mitterrand was convinced by his then–Finance Minister (and future European Commissioner) Jacques Delors to adopt a “strong franc” (or franc fort) policy, in which the French currency would be purposely overvalued to ensure monetary stability and to counteract inflationary pressures. The result was a decade of high unemployment, which lasted into the 1990s. Beginning in June 1981, Mitterrand oversaw the nationalization of twelve industrial conglomerates, thirty-six banks, and two financial corporations. In total, by the end of the year, the state-controlled firms represented 8 percent of GDP. The newly nationalized companies employed well over half a million workers, or 2.5 percent of the total workforce. The nationalized banks now held 90 percent of all deposits. By the end of 1981, the government controlled almost the entirety of the financial sector. Meanwhile, state subsidies for industry were increased sharply: overall, in 1981, state aid for private firms leaped to 100 million francs, or 3.5 percent of GDP. Along with this program of nationalizations and government subsidies, the Mitterrand administration also increased fiscal expenditures, primarily through a major expansion of the welfare state. The fiscal deficit increased from 0.4 percent of GDP to 3 percent between 1980 and 1983, and overall public expenditure rose by 11.4 percent in 1981 and 1982 alone. Government-sponsored early retirement schemes to buy older workers out of the labor force were expanded, and the retirement age was lowered from sixty-five to sixty. Meanwhile, minimum pensions were increased by 20 percent and family allowances were raised by 25 percent. In June 1981, the government increased France’s statutory minimum wage (the SMIC) by 10 percent. Over the course of the years 1981–82, the SMIC was increased by almost 40 percent. In total, from April 1981 to July 1982, the minimum wage rose by 11.4 percent in real terms. This rise in the minimum wage exceeded the growth of median wages, which increased by 5.2 percent during the same period. In January 1982, the standard workweek in the private sector was lowered from forty to thirty-nine hours, with the government establishing the goal of thirty-five hours by 1985. In addition, a compulsory fifth week of paid vacation was introduced. Overall, average employee work hours dropped 3 percent between 1981 and 1983. Furthermore, government employment was expanded, with the government hiring 200,000 new civil servants. Meanwhile, union rights were expanded, notably through the 1982 Auroux Law, which required annual negotiations between employers and union representatives. The legislation increased union rights on the shop floor and sought to establish stronger forms of workplace representation to give employees more of a voice in production decisions. On May 21, 1981, François Mitterrand officially took office. Taxes were raised considerably. Taxation in France centers on the payroll taxes that pay for the country’s enormous social security system. By 1982, social security made up roughly a quarter of GDP — a figure that reflected well over a decade of growth, due to rising unemployment, the widespread use of early retirement programs, and the extension of disability coverage. Many employees were able to retire with a pension worth 100 percent or more of their salary. To finance these welfare expenditures, social charges on employers had already been raised considerably before Mitterrand, but during his administration that proved to be a major cause of employer disaffection. These measures garnered significant opposition from business. While employers found the nationalizations unobjectionable, they were infuriated by the expenditure growth, and especially by the new union rights, introduced by the new government. That exacerbated what had become a chronic problem of capital flight. This had been a constant source of concern among state officials since before the Mitterrand administration actually took power; between February and May 1981, France experienced capital flight totaling the equivalent of about $5 billion. When he came to office, Mitterrand tried to assure the head of France’s main employers’ federation, saying, “The French voted the Common Program. It will be applied as they wanted it. This will be one of the ways to end the class struggle. We want to develop a mixed economy. We are not revolutionary Marxists-Leninists.” Nonetheless, investment did not pick up at any point during the government’s first two years in office, nor did capital flight stop. Growing business opposition to his program was just one aspect of the right-wing backlash that greeted the Left during its first two years in power. During these years, the government faced regular protests by a host of groups — small businesspeople angry over rising labor costs and the imposition of new regulatory restrictions; truck drivers, furious over attempts to enforce higher duties on imports; farmers concerned about an influx of low-cost agricultural goods; Catholics, who mobilized in huge numbers against a promised reform of the education system, which would have resulted in the creation of a fully secular public school system. Yet most troubling for officials in the Mitterrand government was the growing economic difficulties they faced, especially their inability to halt inflation or prevent the growth of France’s balance-of-payments deficit. When a country runs a balance-of-payments deficit, it means that it is buying more from abroad than it’s selling — in France’s case, the trade deficit skyrocketed from 56 billion francs in 1981 to 93 billion in 1982. The rise in France’s trade deficit was a direct result of Mitterrand’s economic program, which had given a huge boost to consumption: net household income, for instance, increased at more than double the rate of productivity growth in 1981–82. By and large, French consumers used that extra cash to buy foreign goods. Thus, in these years, imports of cars rose by 40 percent and purchases of foreign-made electrical appliances by 27 percent. With output rising, productivity stagnant, and imports increasingly expensive due to the rising value of the dollar, inflation began to spiral out of control. In 1982, the inflation rate ballooned to 12.6 percent. As a result, the government found it impossible to avoid repeated devaluations. The first devaluation occurred in October 1981, after months of continuing pressures on the franc. With the Central Bank unable to sustain the value of the currency by means of existing policy options, such as strengthened capital controls, and with foreign currency reserves depleted, officials decided that they had no choice but to devalue. Yet this didn’t ease the pressures on the franc, so by June 1982, after months of continuous capital flight, the government was forced to announce another devaluation — this time to be backed up by a four-month freeze of wages and prices. Public spending was cut by 20 million francs, and the government announced that, in the future, fiscal deficits would be capped at 3 percent of GDP. The decision to devalue in summer 1982 was motivated by concerns about the inflationary effects of increasing incomes. In the first quarter of that year, real wages grew by 4.2 percent, while inflation spiked to 1.2 percent. But the effect of this devaluation was to essentially bring the government’s initial period of reflationary economic policies to an end. Within the government, there were sharp differences over how to respond to the pressures on the franc. The Socialist Party’s left wing, represented by Minister of Industry Jean-Pierre Chevènement wanted to continue with the government’s reformist agenda. These voices were backed up by the Communist ministers, whose influence was limited. They argued that by leaving the EMS, the government would be able to proceed with economic reconstruction unhindered by the constraints imposed by international finance. This alternative option would have required the establishment of more stringent capital controls, and it would have put the government on a collision course with business. France would likely have been cut off from international credit and financial markets, and at the minimum, the costs of borrowing money would have jumped even higher. It also would have restricted consumers’ access to foreign-made consumer goods, and might have required the introduction of even stricter controls on wages and prices. At the same time, it might have permitted the government to continue with its redistributionist program, and avoid the economic dislocation that resulted from the turn toward austerity. For the more right-wing elements within the government, however, that strategy would have been a disaster. Around Mitterrand, a range of influential voices counseled restraint in the face of the growing economic difficulties that confronted French capitalism. These figures, led by Finance Minister Jacques Delors and Minister of Economy Laurent Fabius, argued that retreat from the government’s reformist ambitions was the only choice given the circumstances. Backed up by a number of key economic advisors, they insisted that devaluation and deflation were essential to avoid the collapse of the franc. Departure from the EMS would not only restrict the state’s access to global financial markets, they insisted, but would also exacerbate inflationary pressures, since the price of imports would quickly rise and French producers would be unable to meet the resulting increase in demand. By fall 1981, these economic modernizers within the PS’s leading ranks were already going public with their calls to abandon reflation, with Delors going public with his case for a “pause” in the government’s reform program, in order to allow devaluation to work. Over the next year, proponents of a shift in economic policy within the government became increasingly vocal. This current enjoyed the support of Prime Minister Pierre Mauroy, who shared their concern about the effects of galloping inflation and increasing foreign debts. The denouement came in March 1983, when Mitterrand approved drastic austerity measures, along with a third devaluation of the franc. State expenditures were slashed, and the government imposed tax increases worth 40 billion francs on workers and consumers, while reducing charges on business. Wages were de-indexed from prices, and any adjustment of compensation was capped at 8 percent for the following year. It would be wrong to conclude that Mitterrand’s U-turn resulted from a simple failure of his Keynesian program. In fact, his government’s expansionary economic program was responsible for preventing a much greater contraction of the French economy, amid the global recession of the early 1980s. By one estimate, the evolution of fiscal policy in France was responsible for boosting economic growth by 1.5 percent, while the German government’s policy of fiscal restraint reduced growth rates by almost double that. From 1981–83, joblessness increased by only 1.9 percent, as opposed to 5 percent in Germany and 4.2 percent in the EEC as a whole. At the same time, the Mitterrand government was unable to halt the decline of French industry. The leading industrial producers continued to lose money and market share, and their inability to regain competitiveness put the state in an increasing bind. Nationalization had been a means of protecting jobs and facilitating restructuring in the context of a global economic downturn. But as the crisis of global capitalism continued, the state found itself on the hook for subsidizing ever-greater losses in order to keep unprofitable firms solvent. It was thus forced to provide huge amounts of capital to keep producers in everything from cars to chemicals from going bankrupt. Moreover, the state-owned industrial conglomerates that had been taken over in 1981–82 were running into severe difficulties. By 1982, only two of the twelve newly nationalized firms were turning a profit; total losses by those firms almost tripled by 1983, when they reached $2.6 billion (up from $900 million two years earlier). Nor was the picture any better in already state-owned enterprises, which collectively lost 21.4 billion francs in 1982, after having run a net profit just two years earlier. These difficulties reflected a basic dilemma facing any reformist government that comes to power amid economic crisis. Under pressure to take over failing industries to mitigate economic decline and rising joblessness, such a government will have to bear the costs of keeping unprofitable industries solvent. But that financial burden can place severe strains on a state’s fiscal position, limiting its ability to pay for other kinds of reform measures. The abandonment of reformism is a direct consequence of those reforms that have been accomplished. Since the state is engaged almost exclusively in those activities which are unprofitable from the private point of view, it is deprived of financial resources needed to continue the process of nationalization. Those difficulties were exacerbated by constant resistance inside the state to Mitterrand’s planning agenda: in particular, the powerful Finance Ministry became a center of opposition to state direction of the economy. At the same time, the state struggled to ensure that management in the nationalized firms exemplified its economic priorities — in part because it couldn’t decide whether state-owned industries should be managed autonomously or be subjected to the oversight of officials. That uncertainty wasn’t simply a contingent outcome of indecision or confusion within the state; it was emblematic of a more basic problem that plagued the Mitterrand government’s economic agenda. The capitalist state could oversee limited planning in the favorable environment of the trente glorieuses, but it proved to be a poor instrument for carrying out Mitterrand’s more ambitious planning agenda. As a result, the government’s industrial policy never produced the results that officials had originally hoped. And meanwhile, the franc continued to slide relative to its closest competitors. Between Mitterrand’s election in 1981 and his U-turn in 1983, the currency would lose 27 percent of its original value vis-à-vis the German mark. By the start of 1984, it took 8.6 francs to buy a single American dollar — more than double the exchange rate three years previously, when it took just 4.2 to do so. I want to change the habits of this nation. If the French resign themselves to living with an inflation of 12 percent, then they should know that, because of our economic interdependence with Germany, we will be led into a situation of imbalance. France must rid herself of this inflationary disease. Since we had growth spurred by stronger domestic demand than in neighboring countries, we attracted imports. It would have been different if our production facilities had been able to respond. But that was not the case, for one simple reason: in the years that preceded the arrival of the Left in power, productive investment had made insufficient progress . . . I’d add that business leaders did not like this change of government. When there is no confidence, there’s no investment. That is a problem any reformist government with radical ambitions would have to face, no matter the situation that confronted it when it came to power. The Mitterrand administration tried to resolve those difficulties by negotiating with the representatives of French business. Indeed, some accounts of its machinations during this period claim that it had already agreed to make key concessions to business’s policy demands in early 1982 — thereby initiating the turn toward austerity in secret. But either way, the French case illustrates an important point for socialists to remember: the political power of the capitalist class flows not just from what capital can do, but from what it can choose not to do — invest. It is its control over the investment function, not its collective organizations, that is the key source of capitalists’ power in the political sphere: since, in a capitalist economy, investment is the prerequisite for growth, employment, and tax revenue, policymakers will always have an incentive to prioritize the demands of business confidence over all other considerations. The only alternative is to attempt to seize control over investment. This was not an approach that Mitterrand was, in the end, willing to entertain. Mitterrand’s about-face led to a cabinet reshuffle. But it did not immediately result in the Left’s departure from the government. Chevenement would retain his portfolio as minister of industry for another year, and the Communists would not exit the cabinet until after the 1984 European elections, when the PCF’s score declined to roughly the same as the FN’s. Never again, however, would his government pursue a reflationary economic strategy. From 1983 on, the government’s priorities embodied Mitterrand’s course-correction: rather than growth or employment, the emphasis was now to be on price stability and fiscal restraint. Indeed, by this time, Mitterrand had become “obsessed with inflation” (to quote one of his colleagues). After the turn to rigueur, the president’s economic outlook began to mirror the concerns of the business establishment: already, in fall 1983, he was decrying “excessive” charges on business, telling one radio interviewer that high taxes were the cause of stagnant investment and employment rates. By 1984, the government had begun to cut subsidies for French industry, forcing uncompetitive firms to reorganize and reduce costs. Predictably, the result was a large-scale move to shed excess payroll in order to make French producers more competitive. The resulting spate of layoff announcements was especially damaging to employees in once-core industries: among the hardest hit sectors were steel, where the government announced that it was eliminating 25,000 jobs; ship building, which saw its capacity reduced by 30 percent, resulting in a loss of 6,000 jobs; and mining, which suffered a reduction of state aid by more than a quarter over just five years, resulting in a loss of 20,000 jobs. In subsequent years, the government oversaw the wholesale restructuring of French capitalism: removing subsidies for struggling firms, allowing large swaths of industry to go bankrupt, and dismantling the core institutions of postwar dirigiste model. Under Mitterrand’s watch, the Socialists would oversee the relaxation of employment regulations, resulting in a spate of layoffs and a steady increase in the incidence of atypical employment. Meanwhile, capital controls and restrictions on financial activities were rolled back, as the government pursued its franc fort policy. Over the next two decades, French governments of both the Left and the Right would oversee the privatization of nearly the entirety of the state’s once-large collection of public assets. By the end of the 1990s, essentially all of the nationalizations that Mitterrand had undertaken in his first two years in office had been reversed: banking, telecommunications, electricity, and transportation had all been at least partially privatized. As a consequence, an austerity turn that had originally been framed by its proponents as a mere “pause” in the government’s reform project — a “parenthesis,” to quote one official — turned into a period. Labor’s resistance to these cuts was largely ineffective. For the most part, French unions were unable to defend existing employment levels or job standards against the rising tide of austerity. One of the rare cases of sustained industrial militancy during this period occurred at the Peugeot-Talbot auto plant in Poissy. The largest factory in the Paris area, the complex housed 13,000 workers. In 1982, management announced workforce reductions amounting to almost a third of all the employees at the factory. The workers, many of them immigrants, had long complained about poor conditions, management repression of union organizing, and widespread discrimination. In December, when the labor ministry announced its support for a revised version of the proposed job cuts, they launched a strike, which proved to be quite militant. And yet, in Poissy too, labor eventually succumbed — defeated by the intransigence of the government and the company, and by the conservatism of the unions. Poissy is indicative of the impact of austerity on the French labor movement. Mitterrand’s turn to rigueur exacerbated the decline of union organizations, and further undermined industrial militancy, resulting in falling unionization and strike rates throughout the rest of the 1980s. Those trends would have particularly damaging consequences for the CGT, which saw its membership fall from roughly 2 million at the beginning of the 1980s to around 600,000 a decade later. And yet, on its own terms, the government’s revised economic agenda was in many ways successful. Inflation, which had reached 12.6 percent in 1982, fell to 7.1 percent in ’84 and then 6 percent in ’85. France’s current accounts deficit fell from 2.2 percent of GDP in 1982 to 0.2 percent in 1984; by 1985, France was running a current accounts surplus. And, now able to shed payroll and reduce capacity, French business gradually returned to profitability: by 1985, for instance, the six largest industrial conglomerates that had been nationalized in 1981–82 were all profitable. And yet the costs of that success were enormous. Net wages actually fell by 2.5 percent in 1984. Unemployment rose steadily after Mitterrand’s U-turn, reaching 9.7 percent in 1984 and passing the 10 percent mark by the following year. Joblessness wouldn’t start to fall in any sustained way until the late 1990s. And the “wage share” (the proportion of GDP accruing to employees in the form of wages) would drop steadily after peaking in 1982. Meanwhile, social expenditures only continued to grow. In fact, for the rest of the decade, elevated unemployment would drive a steady rise in welfare spending: by the mid-1990s, financing for social security was eating up 30 percent of GDP. In this context, French governments would repeatedly use the cost burden resulting from high levels of unemployment as a justification for efforts to cut social protections. 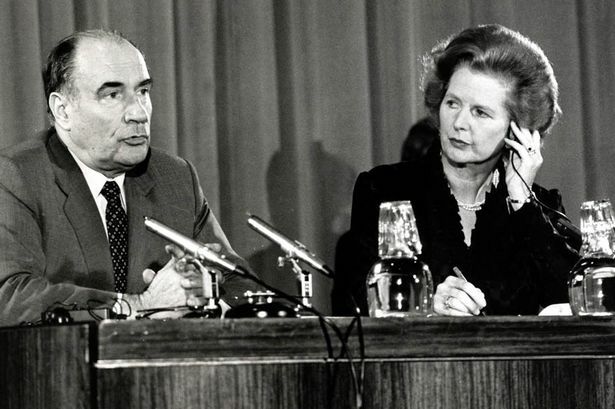 François Mitterrand speaks alongside Margaret Thatcher in 1981. At the same time, the administration’s approach in other policy arenas became increasingly conservative. That shift was especially notable in foreign policy, where Mitterrand became a close ally of Reagan and Thatcher; in education, as the years after 1983 saw him abandon the promise to create a secular public school system in the face of right-wing opposition; and in the criminal justice system and policing, where his initial decision to abolish the death penalty was followed by a shift towards increasingly tough law-and-order policies. Moreover, along with his former finance minister, Jacques Delors (who was appointed head of the European Commission in early 1985), the president would become a key architect of the eurozone and the European Union, for instance spearheading negotiations over the 1992 Maastricht Treaty, which imposed strict budgetary requirements on prospective eurozone members (including limits on annual deficits at 3 percent of GDP and total fiscal deficits at 60 percent of GDP). In fact it was the French government, under his direction, that pushed hardest to create an independent European Central Bank, committed to monetary restraint and price stability. Mitterrand thus played a key role in establishing neoliberal Europe. It’s ironic, given how much his government struggled to overcome constraints not too different from those which confronted Alexis Tsipras, that Mitterrand’s Socialists created the institutional nexus that ended up forcing austerity down Greece’s throat. If we want to explain these reversals, we cannot point to the impact of electoral considerations, or other such immediate political factors. In fact, Mitterrand’s shift toward rigueur produced a sharp fall in the government’s approval ratings: in summer 1982, public support for Mitterrand had stood at a high of 74 percent. Within a year, it had dipped below 50 percent, with 70 percent of the French public saying that the government had been “severely weakened” by austerity. By 1984, Mitterrand’s approval ratings stood at 32 percent, at the time, an all-time low for a sitting French president. Meanwhile, the Left stumbled from electoral defeat to electoral defeat, suffering major losses in local elections in 1983, and European elections the next year, before losing its parliamentary majority in 1986 (in an election in which its slogan was, “Help! The Right is coming back!”). That defeat resulted in two years of government “cohabitation,” during which Mitterrand was forced to work with a right-wing cabinet headed by Prime Minister Jacques Chirac. In 1988, the Left regained its legislative majority while Mitterrand himself was reelected. But his administration would never regain the momentum that had characterized its first two years in office. In one sense, however, Mitterrand’s strategy was effective politically: for if the PS lost electoral support following Mitterrand’s turn to rigueur, the PCF suffered much more. The Communists consistently lost ground to their Socialist competitors during the 1980s — and their fortunes did not improve even after they departed from the cabinet and repositioned themselves as left-wing critics of the government. By 1986, the PCF’s tally in legislative elections was considerably reduced from where it stood in the late 1970s. It continued to drop in subsequent years: by 1995, the party’s candidate for that year’s presidential election garnered less than 9 percent of the vote, and it only continued to drop in the next two elections. In retrospect, the PCF never recovered from the Mitterrand debacle. Voters never bought into the idea that the Communists were really committed to left unity; but having entered the government, the party’s unwillingness to criticize Mitterrand too publicly — for fear of causing a split in the cabinet — proved to be self-defeating. Even after Mitterrand abandoned his reform agenda in favor of austerity, the PCF’s ministers refused to resign their positions. That made it all the more difficult for voters to buy into their attacks on the Socialists after 1984. The upshot of all this was that, by the 1990s, the increasingly neoliberal PS had replaced the PCF as the dominant force on the French left. In that sense, at least, Mitterrand achieved his goals. Mitterrand, of course, was no Leninist, despite what the right-wing newspapers had once claimed. Indeed, in the end, he disappointed even hopes that his government might undertake a moderate reformist agenda — let alone the kind of parliamentary path to socialism he had once promised. Despite his professed revolutionary intentions, and despite the rhetoric of the Common Program and of his 1981 electoral platform, Mitterrand always remained a figure of the mainstream parliamentary left, whose socialism never transgressed too far beyond the boundaries of a muscular, French-style social democracy. His was a technocratic project of economic reconstruction and social reform. 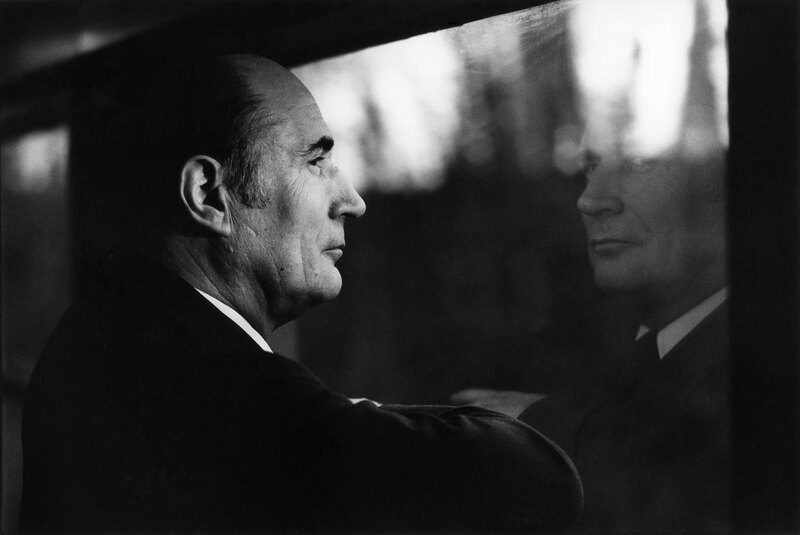 Mitterrand had no interest in mobilizing a popular base to support his policy agenda; he surrounded himself with advisers who counseled restraint and retreat at every turn. And he consistently sought to avoid exacerbating social and political tensions. That’s unfortunate, because only through the kinds of measures and mobilizations that would inevitably provoke intensified conflicts with elites could the president hope to salvage his economic program. The constraints facing French policymakers in the early 1980s were too great for any compromise with capital that might have avoided deflation; these constraints were rooted in the monetary restrictions flowing from France’s institutional commitments in the EMS, and from the impact of deflationary policies in the US and Germany. But more fundamentally, they originated in the structural deficiencies of French capitalism: the chronically low investment and profit rates; the lack of competitiveness on export markets; the inability of state planners to compensate for stagnant productivity growth; sub-standard research and development, and the like. In the circumstances of the early 1980s, avoiding austerity would have required a willingness to undertake increasingly drastic measures: for instance, the imposition of more stringent capital controls to limit speculative pressures on the franc; a commitment to tighter restrictions on the growth of wages and prices; further tax increases to cover rising fiscal deficits; and the development of a more effective, and democratic, planning regime. Embarking on that road was certain to result in escalating conflict with capital, without any guarantee of a favorable outcome. It would likely have resulted in France’s eventual departure from the EMS. A rupture with capitalism would have isolated France, and forced it to pursue a road to socialism in conditions of economic autarky. That only would have been possible through mobilization of the government’s working-class supporters, which would have generated even further recriminations from business, and likely lost the government the support of large swaths of the middle class. To have carried out that kind of a strategy would have required a different government, with a different approach — indeed, given the vacillations of the Communist Party in its attitude toward Mitterrand, it would have required a different left, one willing to communicate a vision of socialist transformation and the difficulties workers would face getting there. On the other hand, an attempt to mobilize working-class support for a sustained offensive against the prerogatives of capital offered the only road out of the long decades of neoliberalization that have followed. Such a strategy might well have failed — but it also would have contained the potential seeds of a real democratization of social and economic life. In that sense, it could have opened up the possibility that the enormous backing for the Left at the time of Mitterrand’s election might have been translated into a genuine socialist experiment. If Mitterrand didn’t go down that road, it’s not enough just to point to his own political weaknesses. It’s not enough just to say that Mitterrand was an opportunist social democrat, who feared confrontation with business. Instead, we should learn from his government’s inability to overcome the structural constraints it faced when it ascended to office. After all, those constraints reflect the same dilemmas any radical government can expect to face when it comes to power. Before Alexis Tsipras, Europe battered François Mitterrand’s reformist ambitions into a sweeping neoliberal program.